They’re not typically regarded as the most critical piece of gear before you get into the grouse woods, but you sure do appreciate them once you’re out there in prime grouse habitat. I’m pretty picky about my brush pants for grouse hunting simply because we put so many miles on throughout the season. They obviously need to hold up throughout the year, and I really don’t want to have to buy a new pair every year either. I want to be able to move without feeling like I’ve got steel plates for pants, and they also need to be comfortable. Throw in the budget, and we’ve got ourselves a pretty good set of criteria for grading different brands. Durability – How well the brush pants hold up against the elements over time. Comfort – Protecting against briars doesn’t do you any good if the inside of your pants are chewing you up anyways. Mobility – There’s always going to be a break-in period, but ideally after a few hunts they should feel like you’re just wearing a normal pair of jeans. Availability – Do they come in a range of sizes, and can you actually get your hands on a pair? Price Point – Do they seem like they’re worth the money when you compare them to everyone else? One other note: I’m not going to compare these pants to normal chaps in this article. Since chaps vs brush pants are more of a personal preference that a quality issue, we’ll stack up chaps in an entirely separate article. Starting our list off strong is the Cabela’s Roughneck men’s upland jeans. These upland jeans are very similar to the Wrangler ProGear upland jeans that we list below, but have a few noticeable differences. The most noticeable difference to me was that the cuff around the ankles was slightly tighter than the Wrangler ProGear. It isn’t that one is better than the other, simply a matter of personal preference. The Cabelas Roughneck upland jeans come in a relaxed fit, which is perfect for pheasant hunting or any other upland hunting. They are well made, and there is zero doubt in my mind that they would hold up incredibly well against even the toughest briar patch. The stonewashed 14-3/4 ounce denim breaks in pretty easily, so you won’t be cussing up a storm as your legs and groin are chafing like some other upland jeans would cause. All things considered, these are a great pair of upland jeans that will be around for a long time if you decide to buy them. As with any Cabelas products, the warranty on them is great & simply icing on the cake. These upland jeans are one of the few highly recommended brush pants on our list. 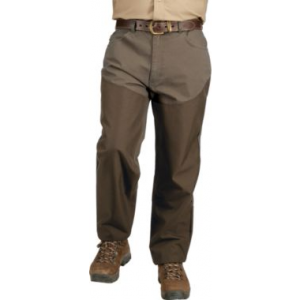 Cabelas took the normal, everyday brush pants for hunting and made them even better with their Dry-Plus performance upland pants. They hold up really well against briars and thorns, and the main pant is made from 100% nylon making them very comfortable. They throw in an extra layer of nylon plain weave to give them the same look & effectiveness as other brush pants for hunting. 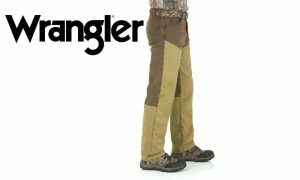 I wouldn’t go as far to say that these are more durable than the Wrangler brush pants, but I do think they come close. 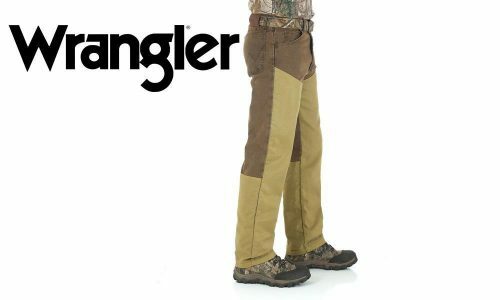 Comfort & mobility come in as some of the best rated brush pants for hunting on this list due to the nylon construction. Like the name suggests, these pants also come with waterproofing that seems to work relatively well. They do this by adding an interior layer of nonporous polyurethane lamination to keep you dry. 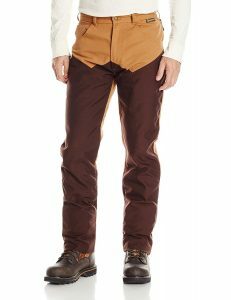 These brush pants for hunting are a bit pricier than other ones on this list, but none of the other brush pants have a waterproof layer either. 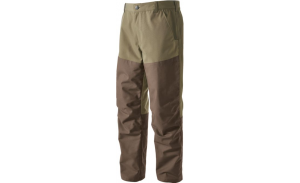 Cabelas finished off these Dry Plus Performance Upland Pants with a soft interior layer to help prevent chafing. Anyone that has ever broken in a new pair of brush pants for hunting can certainly appreciate that! All things considered, these are up there with the best brush pants for hunting on our list! Yes, I know these aren’t technically “brush pants”, but I know so many guys that use them as brush pants for grouse hunting that I had to put them on here. Carhartt is obviously a great brand with products that hold up incredibly well. My one gripe with these double front pants is that with that durability often comes some serious stiffness with their products. 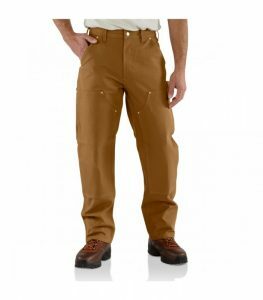 I have a pair of insulated Carhartt bibs that are a few years old and still aren’t broken in, and I don’t see these work pants being any different. All in all they’re a great pair of pants that are going to hold up forever, but the stiffness in them is a little more than I would like. Definitely a solid option, but simply a little too stiff for me to want to wear out in the grouse woods all day. Normally I’m all over any Browning gear, and they came darned close to getting me to buy these Pheasants Forever pants. While they’re definitely a good pair of pants, I’m not a huge fan of the material used for the main part of the pants. It doesn’t seem to move correctly and while I wouldn’t call them “stiff”, they don’t seem to move the way they should. This could just be me being picky & maybe they would adapt after they get broken in, but that was the main turn-off for me. I still gave them excellent points for durability, and they are actually pretty comfortable pants. Availability is good with a solid range of sizes, but the price point feels a bit higher than it should be. Up until last year I had owned the same pair of these Wrangler brush pants for grouse hunting, and while they are definitely not new anymore they are still in remarkably good shape. Literally the only reason I ended up getting a new pair was because I needed a larger size (a few too many Miller Lite’s after the hunt…). I deducted a few points for comfort & mobility because they are pretty stiff in the crotch & they take a while to break in. Being a smaller guy at only 5’6″, I commonly have a hard time finding hunting gear that actually fits me correctly. Before brands like Sitka, Under Armor, etc started coming along I typically looked like the Michelin Man when I headed out hunting. I can honestly say that Wrangler got it right with their ProGear brush pants years ago, as I’ve never had any issue finding a pair that fit. If you’re looking for a reasonably priced pair of brush pants, these are definitely what you’re looking for. I’ll start this off by saying I think GameHide was onto something here, but it just feels like they tried to get a bit too fancy with these briar proof pants. The single back pocket feels really weird when you’re sitting down, and it doesn’t feel like they’d quite hold up to a full season with they type of miles & habitat that I put my gear through. They’re sizes online also only show waist sizes, so it’s pretty difficult to get the size you want without having to play the return game. At the end of the day it seems like these were close, but not quite there. When you’re so sick of getting your legs cut to ribbons that money is no longer a factor, you turn to these Orvis ToughShell upland pants. 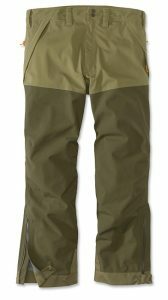 These are far and away the best brush pants we’ve ever put our legs through, and it comes as no surprise that they’re from Orvis. In business since 1856, Orvis has kept the balance between tradition & innovation incredibly well. Not to be outdone by other companies, Orvis unveiled their ToughShell Waterproof upland pants. Like I mentioned earlier, these are the best pheasant hunting pants you’re going to find. They’re absolutely pricey, but that doesn’t come as a surprise when it comes to Orvis gear. Well known by upland hunters & fly fishing enthusiasts alike, Orvis has solidified itself as one of the go-to high end brands in the outdoor industry. 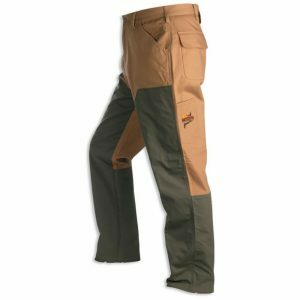 Unlike most other pheasant hunting pants in the industry today, these brush pants are both waterproof & wind resistant. Normally when you add those two features into clothing you end up sacrificing breathability, but these pheasant hunting pants are surprisingly breathable. There is enough room for a bit of layering underneath, and these pants also allow for you to slide them on & off over your boots with zippers at the cuffs. There’s absolutely no way thorns & brush are puncturing these pheasant hunting pants. They are listed as briar proof pants, but you might be able to argue that they’re bullet proof. To sum it all up, these pheasant hunting pants by Orvis are certainly expensive. However you get what you pay for, and there isn’t a doubt in our mind that they’re worth every penny! Did you enjoy this article? Be sure to give it a like up top! You may also like brushing up with our tips for grouse hunting, our article about the best upland vests money can buy, or our look into the best vacuum sealers on the market.